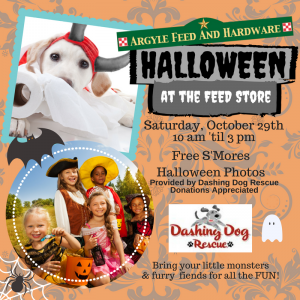 Bring your little monsters and furry, feathery and scaly fiends to Argyle Feed & Hardware for our Halloween at the Feed Store event on Saturday, October 29th from 10 am to 3 pm. We’re serving up free s’mores for all and there might be a few Halloween treats, too! For a small donation, Dashing Dog Rescue is taking Halloween photos. So, round up your ghouls and goblins, load up the hearse and come to Argyle Feed for some Halloween fun! This entry was posted on Tuesday, October 4th, 2016 at 6:06 pm	and is filed under Events, News & Updates. You can follow any responses to this entry through the RSS 2.0 feed. Both comments and pings are currently closed.